Shown are three vehicles involved in a chain-reaction wreck Monday on SR 73 near Prospect Road that sent two people to the hospital. 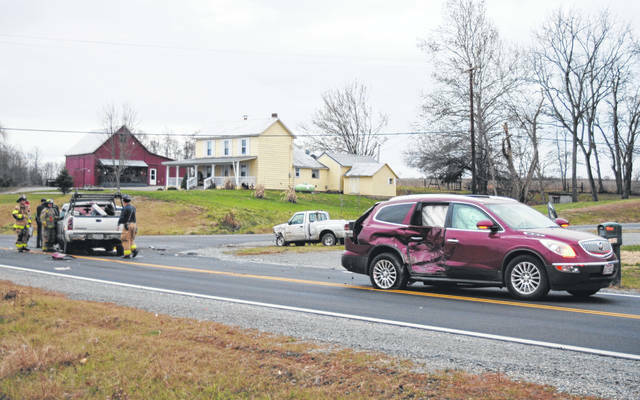 Two people were taken to the hospital with minor injuries Monday after a three-vehicle wreck that shut down SR 73 at Prospect Road for about an hour in the late afternoon, officials said. Trooper David Beck of the Ohio State Highway Patrol Wilmington Post said a preliminary investigation indicates that a westbound Ford Ranger driven by Damian Rhode apparently ran a stop sign on East Prospect Road, causing a chain-reaction wreck involving two other vehicles. According to Beck, the Rhode vehicle appeared to have struck a Buick SUV headed westbound on SR 73 driven by Vernon Kidder, which in turn struck a full-size pickup truck operated by Richard Throckmorton Jr. headed in the other direction on the state route. All three vehicles sustained heavy damage, and Kidder and one passenger from the Buick were transported by ground to Highland District Hospital, officials said. The accident, which occurred around 4:30 p.m., forced some traffic to be diverted through the cemetery at the Prospect Methodist Church.